First there was just food, then came fine dining, fast, casual and most recently fast casual. The basic premise of all these eating experiences has traditionally been that the more money you spend the better the experience and the longer it takes and this market positioning has generally been true within all high street retail sectors. However, in the last ten years the world of retail fashion has seen this theory put to test; the likes of Zara and H&M in particular have broken-the-mould by offering affordable cool fashion at a great price with an experience to match. Cheap became cool. But still the rules of fashion retail remained that fast meant cheap. Recently, however, the restaurant industry has seen the arrival of mould-busters in the form of operators like Five Guys and Shake Shack. These brands have resisted the temptation – prevalent among many fast-food brands – to become more casual and have contented themselves with offering a fast-paced experience within an environment that is designed for speed and efficiency but with one crucial variation….the price. At Five Guys you would expect to pay £27 for a meal for two (two burgers with chips and drinks) as opposed to £13.00 at McDonald’s. This pricing puts Five Guys on the same price level as Nando’s, Pizza Express and even Wahacca who would typically expect their customers to spend at least 45 minutes dining within a relaxed casual environment. So, its casual pricing delivered at speed….a killer concept that customers can’t get enough of. A fast food joint with premium pricing ..…what next? What are the Secrets to the Success of these Fast Premium Mould Breakers? What does this tell us about the future of retail? If Five Guys can sell a good quality fast food product at premium prices delivered in half the time of a casual restaurant their sales can be double – a killer combination. Five guys pricing is on a benchmark with Byron, Cote and Wahacca but with a table turn of three times the speed. And what are the Implications for the Restaurant Industry? 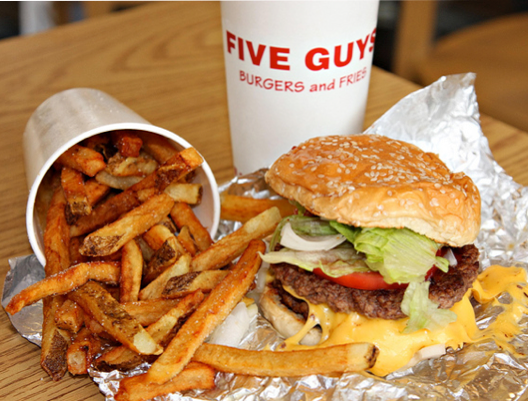 Five Guys has proved that customers will happily pay for a great product delivered at speed…fast no longer means cheap. Fast food competitors will not be directly affected – as their proposition is so different. However, it could force the fast food brands to increase the quality of their products and the fast casual brands to speed up their service. The biggest ripple effect could, however, be seen within fine dining. Maybe Five Guys will help blow the dust off this conservative bastion with fresh look at the culture, etiquette and conventions associated with premium dining….could we see outstanding food served at speed without the elitist service or traditional paraphernalia…A £80 meal in 20 minutes? And of course Five Guys will ultimately trim their pricing to a level closer to their US levels (currently half UK prices). Can Fast Food be Premium?